The PNG LNG Kumuls have four tests scheduled for 2018, the Pacific Test, the Prime Ministers XIII to become an sanctioned test match and a two-game tour by an England emerging team. PNG Rugby Football League chief executive officer Reatau Rau who was accompanied by Kumuls coach Michael Marum made the announcement in Port Moresby yesterday. “The coming test is the Pacific test where on June 23 Papua New Guinea will take on the Fiji Bati. This will be the only test played overseas,” Rau said. He also said the change to dates for the Prime Minister’s XIII match that will be held on October 6. “This date has changed from a week before the grand final to a week after the grand final and will be called the Prime Minister’s XIII Test. “After the Prime Minister’s XIII last year we saw that most of our top players were still in the finals series,” Rau said. “The sponsors and the people have spoken about the team’s performance against the Australian Prime Minister’s XIII and the NRL has heard our request. They have gone back and moved the annual fixture a week after the grand final … its good they heard of our views. He added that the final two test matches will be against the emerging England team, the Knights. “The England Knights are the emerging England side and they are going to have a serious tour. They will be playing two games – one on October 27, the first match will be in Lae and the second will be in Port Moresby on November 3 at the Oil Search National Football Stadium. It has been a long time since a team has done a tour in Papua New Guinea,” Rau said. 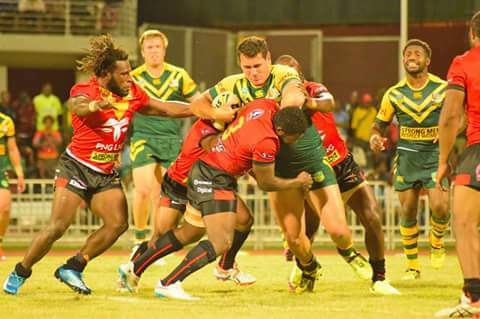 “Coach Michael Marum says the last time a team made a serious tour was in 2001 when the French Roosters played in Goroka and in Port Moresby. Rau added that on October 13 there will be an Emerging Kumuls team to take on the New South Wales Country Under 23 team. The curtain raiser to that match will be the a match between a Australian Defence Force women’s team and a select Confederate women’s side while the Oil Search PNG Orchids will face the Australian Jillaroos on October 6 as the curtain raiser for the PM’s XIII match.